I like the graph trinker! I wonder what other aggregation we can do, maybe something that accounts for timezone (since every hour is locally different), and include a scale on the right to show what the continuous variable represents (graphs need to be completely informative, at least in the final analysis). I decided to showcase the use of images in R graphics. Lets take a look at the forum's from a spammer perspective. Generally speaking its a dangerous place, with ravenous moderators around each corner waiting to devour their posts and ban them for all eternity. Thus lets see how the TS mods compare in evil (from a spammers perspective) to famous cinema villains. Using data from the net, on villain body counts and comparing these to the mod ban statistics we can get a mle estimate of how the mods compare to famous villains. This finally give us an opportunity to scientifically prove who is a raptor and who is a (Skynet) bot. [I would want to compare mods to super heroes but there is no way to rank super heroes objectively that I can think of]. In the analysis I assume that ban stats are a Poisson distributed random variable. #have you set your image working directory yet? As we can see there are certainly Raptors on the forum, Dragan is as deadly as Chucky, Dason is likely the Predator but cant be significantly distinguished from the T101 (a bot). Quark, like his DS9 Ferengi bar-tender counterpart, is likely an Alien (but still most likely a Raptor)... bugman will incubate his spawn in your abdomen... and funny enough I'm Darth Vader. Does this mean quark is a raptor? Also, as I am Darth Vader, I would like to urge bugman to finish that death star in his avatar. I want it fully operational! So we've been having some mass spamming lately and it's definitely easier to take care of big chunks of spammers using methods that do get counted by the forum. I'm up to 490 now. I only bring it up because this puts me much further away from the raptor on that chart. Thought I'd chime in if nobody minds with the Breather surface.. I wonder if anyone would be up for the challenge of creating an R script that will draw a raptor with as little parameters as possible? What about recreating the old one historical milestones with the oldy (Something like it has scanned from old book) look. 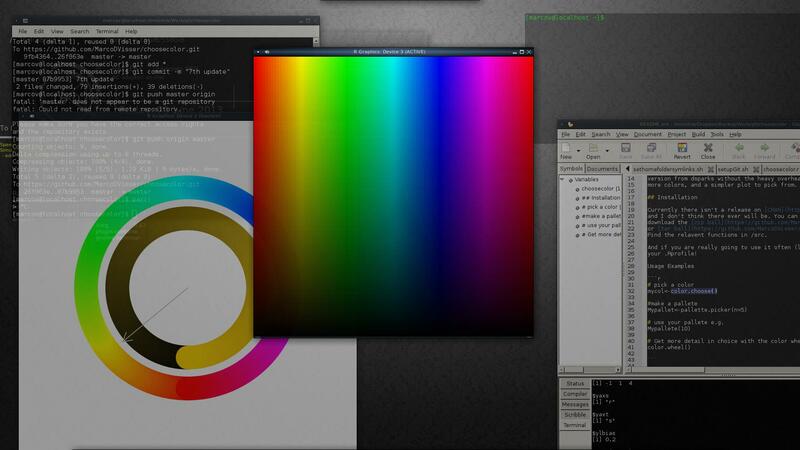 One of the most painful experiences is selecting colors in R.
As I was fooling around with github, I thought I might just upload my color selection tools. Please find them here - downloads available in the description. One of the cool things that they let you do is choose colors interactively. So please, let me know if you like them, have any suggestions, or think I should develop them further (aka if they will be valued by a larger audience). You should turn that into a package. I am going to do that now, in the style of your awesome and criminally underrated "findPackage". Or do you mean go all the way to CRAN? Error: could not find function "pallette.picker"
These issues should now be solved. It is now officially a package (in development). I would appreciate if anyone wanted to test it! (A ggplot version also included -with the code).